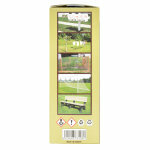 Ideal for many uses, such as: garden posts, sport posts, agricultural posts and signs. 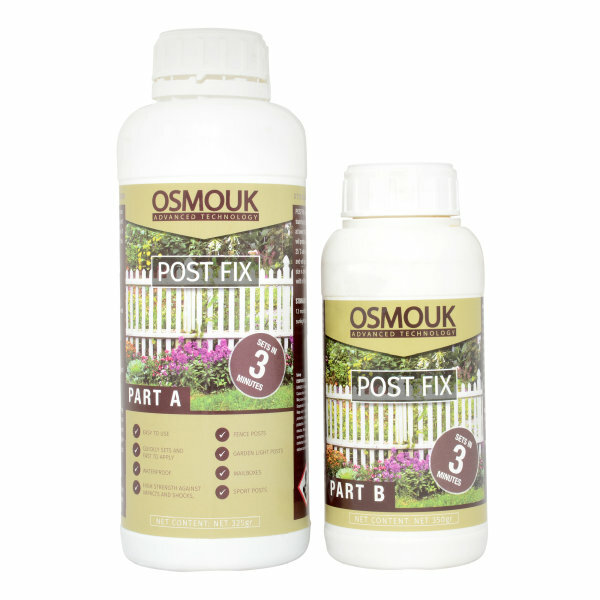 Osmo Post Fix is a fast setting Polyurethane foam which is designed for supporting and backfilling of PVC, steel, wooden and many types of in ground posts. Once these products have been mixed together and poured into the hole, this product will expand to fill the peripheral void between post and the hole. 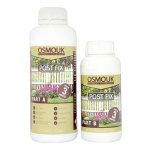 Post Fix eliminates the need for heavy bags of concrete, use of water and less mess when mixing. Depending on temperature this product usually sets within 3-5 minutes and no time is wasted on heavy lifting. Waterproof product which helps protect the post against rotting and allowing this to be used outside, in both summer and winter time. Adheres to vinyl, wood and metal posts as well as to the ground better than concrete. 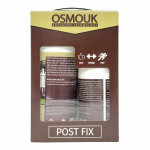 OSMO UK Post Fix is a fast setting, two component easy to use PU Montage Foam. Specifically designed for supporting and backfilling of wooden, PVC, steel, concrete and many types of in-ground posts. Pre-proportioned system that expands to fill the peripheral void between a post and the hole. Fence posts, garden light posts, mailboxed, signs, sports posts and poles such as basketball, football, volleyball and tennis. Make sure that there is no standing water in the hole before pouring Post Fix. The bottles acclimatized at 22°C-25°C for at least 2 hours before using. Pour component A into the component B and shake the bottle for 20 seconds. Pour mixed material into the hole before expansion starts. Do not move and support the post during the curing process of Post Fix. Polyurethane components are moisture sensitive. Therefore they must be stored at all times in sealed, closed bottles. In hot weather, Post Fix will react very quickly do not over mix. Never allow the foam to start to expand inside the bottle. 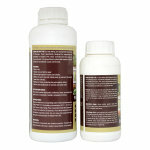 Product from bottles kept at lower than 22 °C will take longer to react, expand and set, and will produce less volume. Product from bottles kept at higher than 25 °C will react, expand and set faster, lowering the working time and will produce a higher volume, weaker composite. Proper hole size is determined by the size of the post you use. Generally, the width of the hole should be twice the dimension of the post.